After 12 days of travel and visits, we finally arrived home last night. We had a wonderful time visiting family and friends, but it's good to be home. 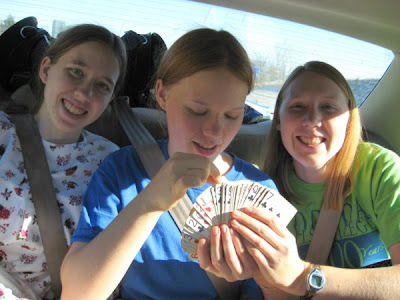 There was a lot of time spent in the car, but I kept busy reading, playing games, writing, and sewing. After visiting some friends on the way, Christmas Eve found us in Kansas City with relatives. It was so nice to see Grandma and Grandpa again, plus my aunt's family and Maria's family. 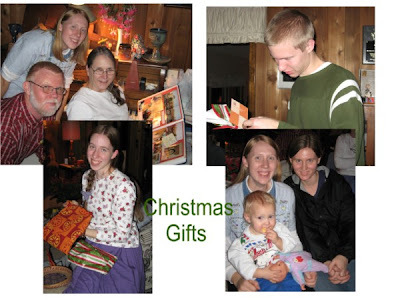 We opened our gifts on Christmas Eve, often a tradition of ours. While there, we got to experience something very rare in Alabama: snow! 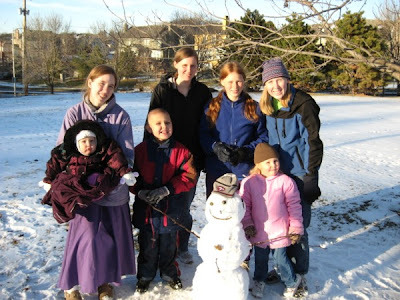 There was already a beautiful blanket of snow when we arrived, so we promptly set out with our nephew and nieces for a walk, snowball fight, and to build a snowman! A few days later it snowed again; it was so beautiful to watch the fluffy flakes fall! It wasn't as nice when we had to drive through it, but it was a new experience! 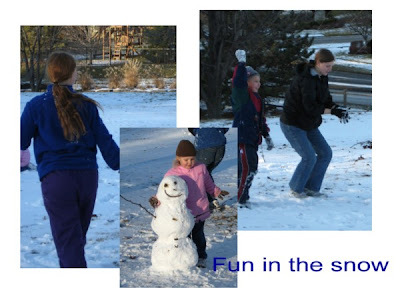 It was James and Sara's first time to play in that much snow! Lisa Beth just watched, bundled up snuggly. For New Year's, we went to my brother Luke's house in Arkansas. We had a fun time with the whole family, playing games, talking, and just enjoying each other. 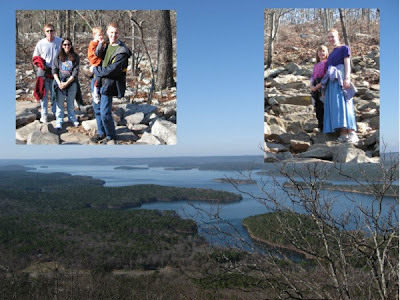 On Sunday afternoon, December 30th, we hiked up Pinnacle Mountain. Our family lived in Arkansas until I was 4, so I have faint memories of climbing it then and later when we would go back to visit. It was fun to climb it again; though the climb was a bit rocky, all 4 children did very well, and there were plenty of arms to carry the two smallest when they tired. The view from the top was splendid! Since we were there, we decided to get a sibling picture. 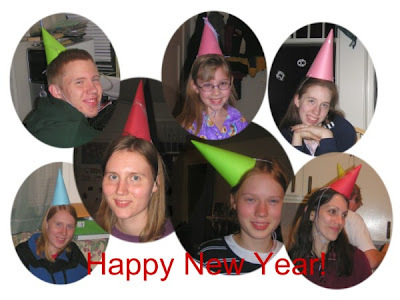 We had a fun New Year's Eve party, making party hats, watching movies, playing Ten Hole Golf, and eating delicious snacks and punch. It looks like ya'll had a marvelous time! It is nice to see you back! I am so glad to see you back. What lovely pictures. You always seem to get great scenery shots. Just curious....where are the photos of you and Jen? I'm glad y'all had a good time! Can't wait till this Friday! Courtney: We did indeed! It's good to be back! Ella: I'll be doing a separate post with the pictures once I get them. Jennifer took them on her camera, and I haven't gotten copies of them yet. We had a great time together, though! Miriam Rebekah: I can't wait either! It looks like you've been having all kinds of fun celebrating the Christmas season! Looks like you had a lot of fun.Nice views from the mountain top. Would it be ok if I added the Maidens for Modesty graphic to my blog? SO glad we had time to spend together. It really topped off my Christmas. 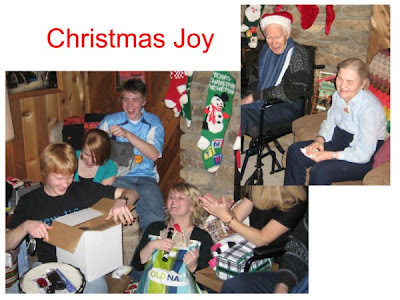 Looks like you had a wonderful Christmas! 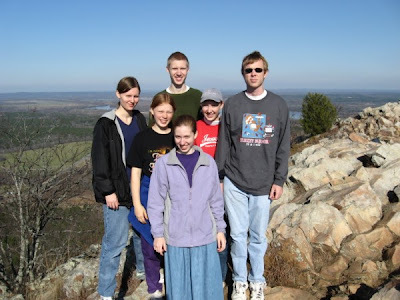 We climbed Pinnacle Mountain when we lived in AR. It was quite a climb on the rocks near the top! Robert, sure, we don't mind! I guess the graphic's could be for those who support modest maidens, not just the maidens who are. Jen: That's for sure! Jubilee's always ready for a game. But, it gives us an excuse to be together. 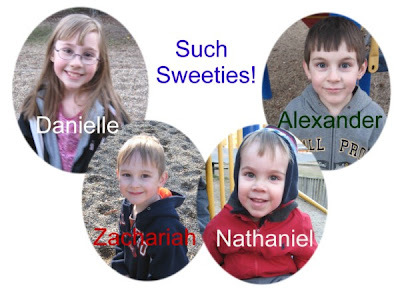 =) I'm also so glad we got to visit with your family after Christmas! Allison: That's neat that you used to live in Arkansas! I was born there. Yes, the rocks near the top were quite a climb!